Today we launched a brand new service, geared towards news enthusiasts and casual headline scanners: start.me/channels. Over the past years, start.me has built a vast library with thousands of high-quality news feeds. These feeds could already be accessed through our widgets. With start.me/channels, our collection of carefully selected and syndicated news sources can be accessed directly, offering you a magazine-like experience to read up on everything important to you. We use sophisticated algorithms to create a channel experience that is up-to-date, easy to read and absolutely beautiful. Channel pages are automatically adjusted to your screen size and show the most relevant news first. Our new channels serve a dual purpose: they give a great overview of the current news, allowing you to quickly catch up. But they can be used to find new building blocks for your personal start page as well. 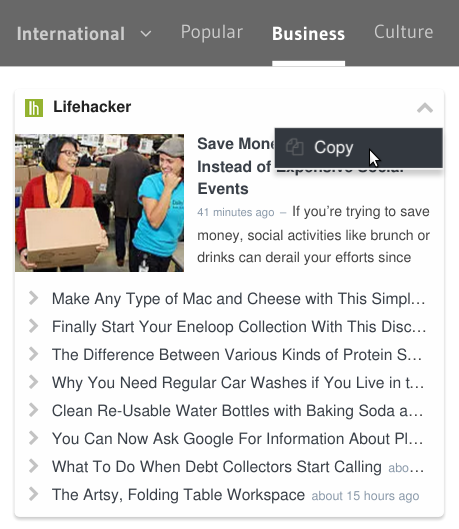 If you like a particular news feed, just select the Copy option from its menu and copy it to one of your own pages! For our more experienced users it is good to know we added RSS-feeds to each of our over 400 channels, allowing you to quickly grab all headlines and put them in a widget. To do so, use our browser extension or simply append .rss to the channel’s address and specify it as the feed URL in the RSS widget. Of course we are very eager to hear how you feel about start.me/channels. Any remarks or suggestions are more then welcome. 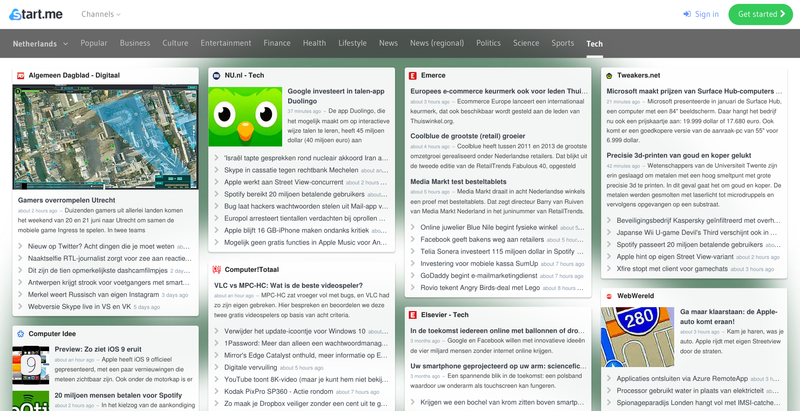 If you feel the layout of channel pages could be better or some important feeds are missing, let us know! Either leave a comment or send us an email: support@start.me. I like this idea a lot. I just set up a custom news page composed of feeds from various news channels. The “copy” feature made it quick and easy. Lost. Created a new page called ‘News’ but when I try and copy a news source the new page doesn’t appear in the drop down list, only the start.me page is offered. Popular is the only tab populated. Where are all the other categories??? Which region (shown as the first tab) was being displayed? The South African news channel has been filled now with feeds. Please do let us know (support@start.me) in case you see any important sources missing. It’s a good idea and looks great!! But… let me tell you I think you should look over the sources or the Argentina page. The main sources used are 3 o 4 very biased ones: Clarín, La Nación, Perfil, Urgente24. You should include other feeds so us readers from Argentina (and other countries) can see both sides. Thank you very much for those suggestions! I will forward them to our editors! I’m the editor for the es-AR locale of start.me. I will reply you about those websites you mentioned. • Ámbito Financiero & El Cronista weren’t offering W3C standard feeds, they had a bunch of glitches at the time I looked at them. I will take a look at them again next week. • Infonews, Télam, minutouno & Página/12 have not relevance in Argentine massive press. They are not best sellers nor the most visited news websites in Argentina, as you probably already know. Of course, you can add them for your personal use though! • La Razón‘s feed was not working fine when I checked it a couple of months ago. I will recheck it soon. In the meantime, check this, I’m reviewing those webpages once a month, so if you think of any relevant site for Argentina, let Michiel know, and I will check if it’s OK to include it. Great addition, and I’m impressed by the loading times! Keep up the good work! Prachtige toevoeging! Over het algemeen ben ik geen voorstander van het blijven toevoegen van extra functies aan een al prima uitgewerkt concept, maar, in dit geval is het heel intelligent gedaan. Neemt geen extra ruimte in, is zeer overzichtelijk en uiterst makkelijk configureerbaar. Alles in één oogopslag zonder extra klikken te verkennen. Kan niet anders zeggen dan: uitstekende productieve toevoeging welke het programma nóg interessanter maakt. Moet alleen wel oppassen dat ik niet in Start.me blijf steken maar wel verder ga met mijn overige computer-taken!